Use the infographic below to help find the right Justboom for you! Click on a product to explore compatibility and features. View the JustBoom DAC HAT board. The JustBoom Amp is a standalone high quality audio power amplifier that is designed to either stack on top of the JustBoom DAC / DAC HAT or alternatively take a line level input. We’ve designed the JustBoom Amp to be simple to use – with no soldering required and all the mounting hardware already provided, this is a true plug and play device. View th JustBoom Amp HAT board. View the JustBoom Digi HAT board. We’ve designed the JustBoom DAC pHAT to be simple to install and use. With no soldering required and all the mounting hardware already provided you can be up and running and enjoying flawless high quality audio playback within minutes. this product is suitable for absolute beginners and seasoned professionals alike. Just connect your DAC HAT to a set of powered speakers or an audio amplifier and you can be up and running quickly, enjoying flawless high quality audio playback within minutes of setting up this Raspberry Pi HAT. We also include an optional IR receiver to allow remote control operation of your Raspberry Pi. View the JustBoom DAC Zero here. The JustBoom Pi Zero AMP pHAT is a high quality amplifier designed specifically for the Raspberry Pi Zero. Simply stack the HAT onto your Pi Zero and then connect your speakers. Read more about the Amp Zero board and its features. The JustBoom Digi Zero pHAT is a high resolution digital audio output add on board for the Raspberry Pi Zero. The HAT produces a high quality audio data stream that will not be negatively affected in any way. Read more about the Digi Zero pHAT and its features. Stack the Amp and DAC boards together on top of your Raspberry Pi for the ultimate high quality audio device. Connect your JustBoom DAC to a set of powered speakers, headphones or an audio amplifier and you can be up and running quickly, enjoying flawless, crystal-clear high quality audio playback within minutes of unboxing. If you need amplification or additional outputs for passive speakers, the JustBoom DAC is also compatible with the JustBoom Amp – just stack the Amp on top with the mounting hardware and board to board connector and you will be good to go. This affordable, standalone DAC has among the best value for money available on the market and truly reduces the barriers to entry for versatile high quality audio playback. The digital (S/PDIF) inputs include both optical (TOSLINK) and coaxial/RCA connector options. The onboard DAC chip offers a 384kHz/32 bit output (although this is limited due to the input S/PDIF receiver to 108kHz/24bit). The JustBoom DAC additionally includes a 138mW headphone amplifier. 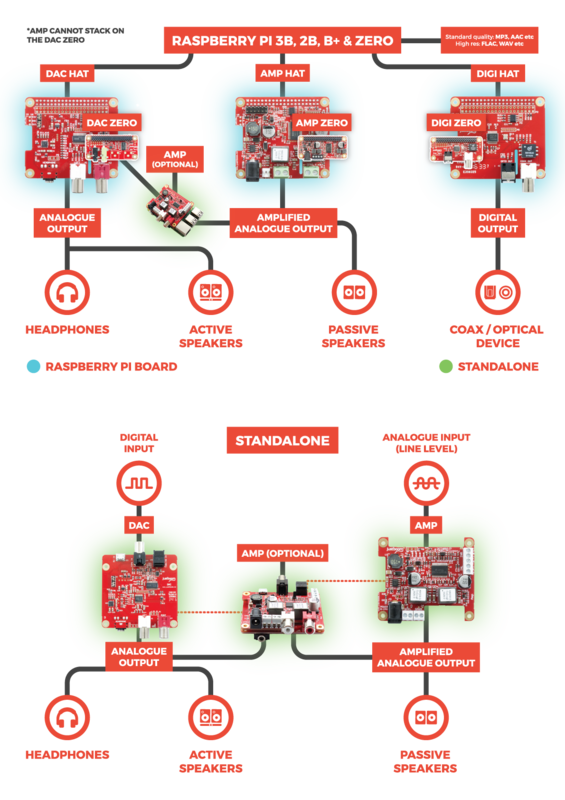 Read more about the JustBoom DAC. Stack your Amp on top of your DAC to create the ultimate high quality audio device. The JustBoom Amp provides a 2x55W (peak) amplified stereo output. Just connect your JustBoom Amp to a set of passive speakers and you can be up and running quickly. Enjoy flawless high quality audio playback within minutes of unboxing. Includes an advanced Class-D power amplifier chip for a peak power output of 2 x 55 Watts. The JustBoom Amp outputs audio over two speaker cable connector blocks that accept anything up to 14 AWG cable and will provide crystal clear audio to either 4 or 8 Ohm passive speakers. Read more about the JustBoom Amp.